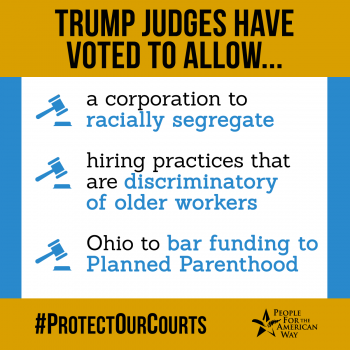 The Supreme Court and lower federal courts have a direct impact on our rights and liberties, but the president is stacking the bench with narrow-minded elitists who serve the interests of corporations, the powerful, and the wealthy our expense. 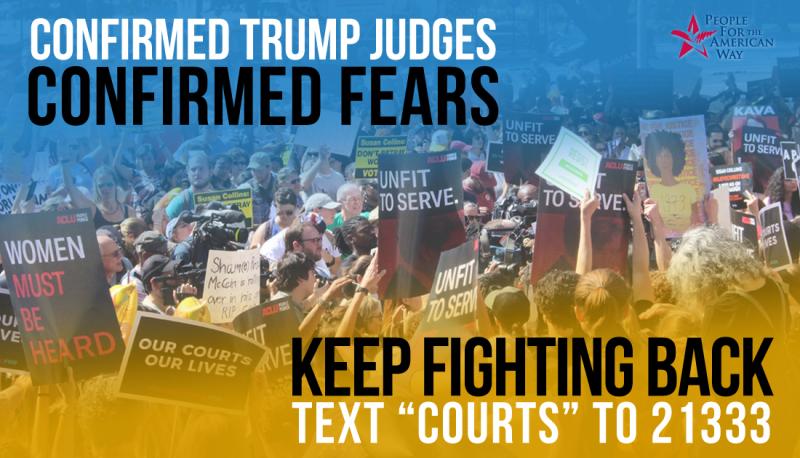 We can’t afford this extreme right-wing takeover of our courts. 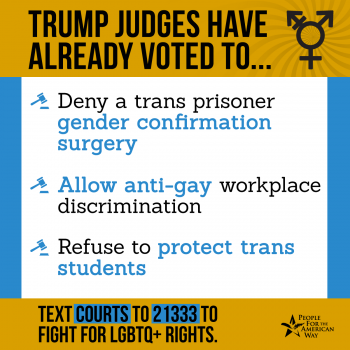 These extreme Trump-appointed judges are quickly rolling back the clock on rulings that protect women, people of color, workers, consumers, immigrants, and the LGBTQ+ community. 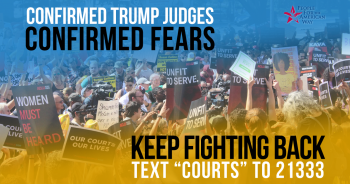 PFAW’s Confirmed Judges Confirmed Fears report analyzes and documents the harmful impact of Trump’s judges on all of our rights and liberties – and we need your help to spread the word about what’s at stake if Trump’s judicial takeover continues. 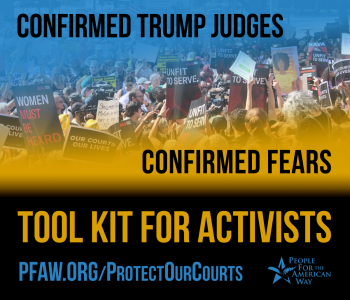 In this toolkit, you will find resources to help you organize your community to help stop the damage done by these judges who are serving in lifetime seats on our federal courts and to hold senators accountable for their role in confirming these right-wing ideologues to these seats. By signing the petition, you’ll receive regular updates on the fight for fair-minded judges. Call 1-855-867-4904 to be directed to your senators. 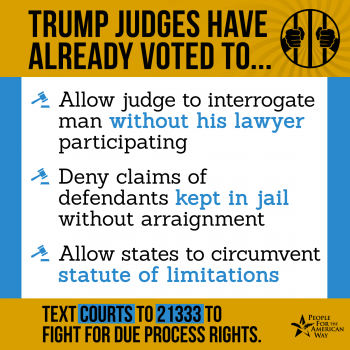 Or text courts to 21333 to be connected. Donald Trump has appointed 39 judges to lifetime seats on the Supreme Court and the federal Courts of Appeal, which sit just below it. 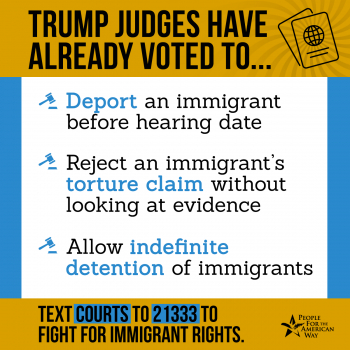 These judges could serve for decades, and many of them have already handed down opinions have harmed workers, consumers, voters, immigrants, people of color, reproductive rights, and more. 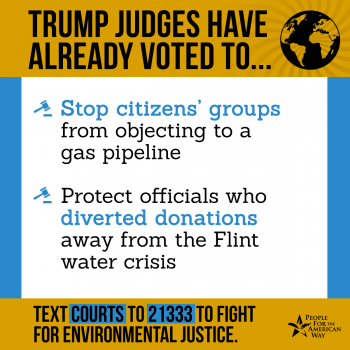 Trump Justice Neil Gorsuch was the deciding vote in more than a dozen decisions which, among other damage, upheld Trump’s Muslim ban; approved Ohio’s purge of more than a million voters, and deeply undermined workers’ right to form a union. Trump Justices Brett Kavanaugh and Neil Gorsuch cast deciding votes that approved indefinite detention of some legal immigrants, put into place the Trump military transgender ban, and authorized the immediate execution of a prisoner before a lower court could consider his religious discrimination claim. 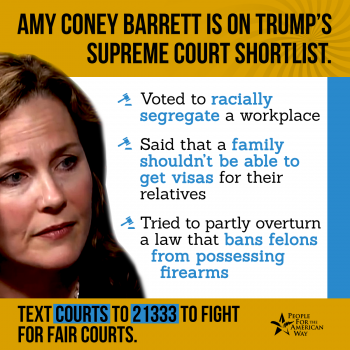 Trump 7th Circuit Judge Amy Coney Barrett voted to allow a corporation to racially segregate its workplaces. 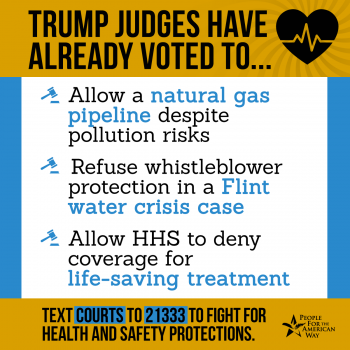 All four Trump judges on the 6th Circuit – Judges Thapar, Bush, Larsen, and Nalbandian – voted to let Ohio bar funding to Planned Parenthood for health care because it provides abortions with non-state funds. 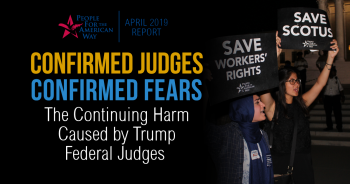 All four Trump judges on the 7th Circuit – Judges Barrett, Brennan, Scudder, and St. Eve – cast deciding votes to rule that older workers cannot claim that an employer’s hiring practices have a discriminatory impact on them, despite federal law. The three Trump judges on the 11th Circuit – Newsom, Branch, and Grant – joined an opinion by Newsom that made it much harder for victims of illegal job discrimination to prove their case and “drops an anvil on the employer’s side” of such cases. In cases where they did not have enough votes to form a majority, Trump justices and appeals court judges made clear that they’d like to go much much further. They’ve laid out radical ideas that would do even further harm to Americans’ rights concerning voting, religious liberty, privacy, LGBTQ equality, money in politics, gun safety, and more. With more Trump appointees on the bench, they could make that threat a reality.